I worked with a client “Gina” who in the first part of her career had been a high-powered management consultant. She was well paid, plus she got to travel all over the country, but it was work that she had fallen into early in her career path and she became unhappy in her job, so in her thirties she decided on a complete change in career and retrained as a secondary school teacher. I only had the chance to read for her after the change, but it was clear from reading her Akashic record that her soul gifts were more aligned with teaching children than they were with management consulting, and although her new teaching role did not allow her to travel, and it wasn’t as well paid as management consulting, she loved it and had recently been promoted to Deputy Head of her department. You enjoy your work more, you’re good at it and you tend to be supported by the Universe in what you’re doing. You’re working with the flow, rather than going against it. Alignment with your soul purpose and gifts results in more fulfilment, more growth and more abundance. By contrast, when you do work that doesn’t really align with your soul’s purpose or gifts, you can feel it. You may be good at what you do, but your heart’s not really in it. In this scenario, you will also feel like you’re in a dead end — there’s usually no career progression and you may get the sense that you’re stagnating. You could also struggle to find (or keep) employment. Did you know that reading the Akashic Records is a very good way to find out what your soul gifts and purpose are? (and by extension, the kind of work that would be a good expression of these). For those who are reading who don’t know, the Akashic Records are a giant etheric database that hold information about every soul in existence, and they can shed light on your soul’s past, talents, lessons, and more. They can even advise us on the area of career. I talk about the Akashic Records a lot on my blog and that is because as an intuitive, I specialise in reading the Akashic Records. As a reader, one of my favourite things is when a client tells me what their career is, and it is very clearly a perfect reflection and expression of their soul gifts and purpose. But equally, reading the Akashic Records can often help people who are unsure what sort of work would be a good fit for them. 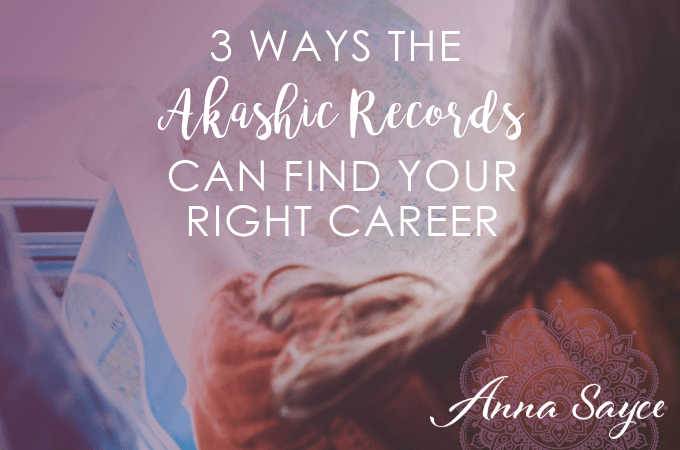 When I do an Akashic Record reading, there are three areas of the Akashic soul record that I would look closely at when advising a client as to what sort of career would suit them best. In this article, I am going to explain what these three areas are, and how they can shed light on what motivates & lights us up, on a deep level. I’m going to start with the first area, which is the soul’s Archangelic Realm of Training. To give a bit of background on what the Archangelic Realm of Training is: there are seven realms of existence in the Universe, each one corresponding to a chakra in the physical, and each one presided over by an Archangel. Each realm holds energies that are necessary for human life here on earth and every soul who incarnates here has trained in one of these realms. When the client does this, he/she then brings those energies into the physical, often through their choice of work. And so, the Archangelic realm of training is the first thing I would look at when reading for someone in the area of career — it very often indicates the client’s strongest soul gifts. For example, if you have the fifth realm of training (corresponding to the throat chakra), you have a lot of energy running through your throat chakra and you need to have a strong communication aspect to your work. This could be writing, teaching or speaking. To give another example, if you have the fourth realm of training (corresponding to the heart chakra), you’re more likely to be a healer, and that could be physical healing, emotional/psychological or even spiritual healing. The Archangelic realm may also predict how you approach your work and what is important to you in the area of career. For example, if you have the sixth realm of training (corresponding to the third eye chakra) you are a truth-seeker, a truth speaker, and when necessary, a whistle-blower. You need to work within an organisation that holds truth and integrity as one of its highest values. You are turned off by anything that entails having to even slightly bend your principles — your dedication to truth will come before all else. There are 22 soul groups of origination that I know of. Some of these soul groups offer information about what sort of work a person is drawn to, whereas others do not have so much influence over our choice of career — it all depends on the group. I find it interesting that so many of my Akashic Record Reading Program students (especially those who are thinking of starting spiritual businesses) belong to one soul group in particular (Mintaka). That makes sense since Mintakans loves to help others with their spiritual development. Lately in my readings, I am also seeing a lot of Blueprint Changers, who are healers on the soul level. My Blueprint Changer clients often work in areas like medicine, psychotherapy and social work. These are a collection of soul gifts that a person has. Sometimes these archetypes can come from past lives, other times they spring from your Archangelic Realm of Training or your Soul Group of Origin — and when that happens, Spirit is reinforcing those gifts as a key part of your life purpose. Basically, these archetypes give us more information and clarification about your soul purpose and strengths. There are 34 archetypes that I check for when I read for someone — I always ask for the top 5 for my client. These are archetypes like ‘lightworker’, ‘harmonizer’ (someone who brings the energies of harmony into groups & teams), ‘banner carrier’ (this is an activist archetype) and ‘improving systems’ to name just a few that sometimes come up for my clients. And so those are the 3 areas that I look at as part of a Career Reading – the Archangelic Realm, the Soul Group of Origin & the Archetypes. For me, the most important part of a career reading is looking at those 3 things together. There are several Archangelic Realms, 22 soul groups and 34 archetypes, so it is the client’s unique combination of these that can shed light on what his/her soul purpose is. To explain how all of this can manifest in practice, I want to share with you my own Akashic soul record (including the soul group of origin, Archangelic realm and archetypes) and how I feel it links in with my work. My soul group of origin is Sirian, I have the third Archangelic realm of training and my archetypes are: communicator, analyzer, harmonizer, pointing out gifts, truth-seeker & counsellor/advisor. Sirians are very improvement and evolution oriented souls. They love to help other people evolve and they like to improve upon systems. (A lot of Sirians have brought through new spiritual tools & technologies, too.) They are very organised, love structure and have good strategic skills. The Sirian side to my soul allows me to take something that can be rather hit and miss (e.g. psychic development) and systemise it, bringing structure and a step-by-step approach, that results in success for students. Having the third Archangelic realm of training means that I bring the energies of balance and harmony into the physical realm. If you have this realm of training, you may not be particularly balanced in your own life, but you balance other people out. My website name used to be ‘psychic but sane’ which I feel is a good example of how this realm of training has manifested for me. I am quite practical in my approach to spiritual topics. I like to blend concepts from psychology with spirituality — you’ll see this in my approach to cord cutting and in my book for empaths. I hope that gives you a good overview of how these gifts can express themselves in our lives. • The Akashic Record Reading – delivered by email $349 – this is the “full enchilada”. In this reading, I go into your Archangelic realm, soul group, archetypes, intuitive gifts, past lives, life lessons, soul trainings between lifetimes, and the astral & Divine-level beings around you. The Akashic Mini Reading & Career Readings are only available for the month of April, in limited quantities. Anna, can you tell me what Archangels oversee each of the Archangelic Realms of Training, and what chakras these Archangels are associated with please?